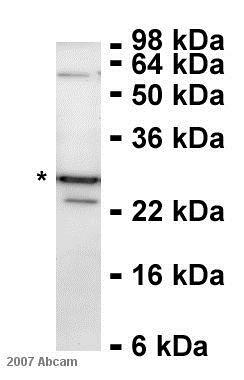 Synthetic peptide conjugated to KLH derived from within residues 1 - 100 of Human FKBP25. Our Abpromise guarantee covers the use of ab16654 in the following tested applications. WB Use a concentration of 0.05 - 1 µg/ml. 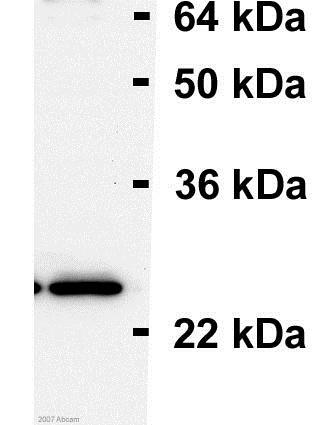 Detects a band of approximately 28 kDa (predicted molecular weight: 25 kDa). 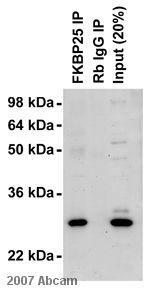 FK506- and rapamycin-binding proteins (FKBPs) constitute a family of receptors for the two immunosuppressants which inhibit T-cell proliferation by arresting two distinct cytoplasmic signal transmission pathways. PPIases accelerate the folding of proteins. Belongs to the FKBP-type PPIase family. Contains 1 PPIase FKBP-type domain. 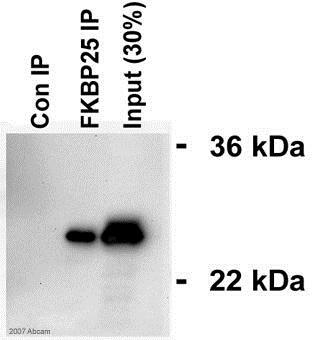 ab16654 specifically recognises FKBP25 (lane1), which can be blocked using the N-terminal immunizing peptide (lane2) but not the corresponding C-terminal peptide (lane3). 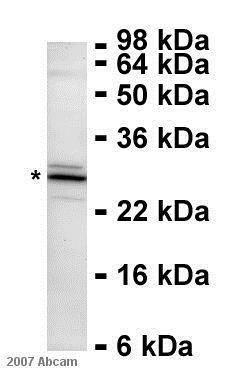 ab16654 immunoprecipitating FKBP25 from rat PC12 whole cell lysate. 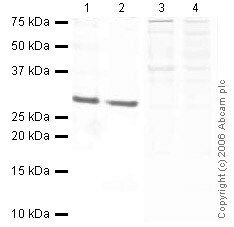 A protein A matrix was used and the antibody was used at 4ug/mg of the lysate. 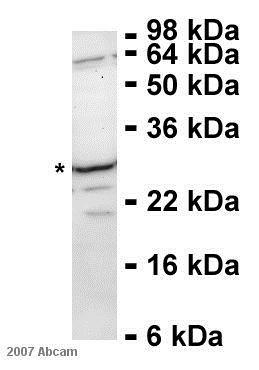 Ab16654 was used in subsequent western blot (Lane 1). Lane 2 shows control IgG immunoprecipitate, Lane 3 shows input material. ab16654 staining FKBP25 in human testis, showing a distinct and strong staining pattern at cells in ductus seminiferus. Paraffin embedded human skin tissue was incubated with ab16654 (1/1000 dilution) for 30 mins at room temperature. 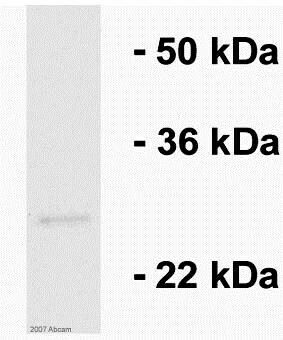 Antigen retrieval was performed by heat induction in citrate buffer pH 6. Publishing research using ab16654? Please let us know so that we can cite the reference in this datasheet.